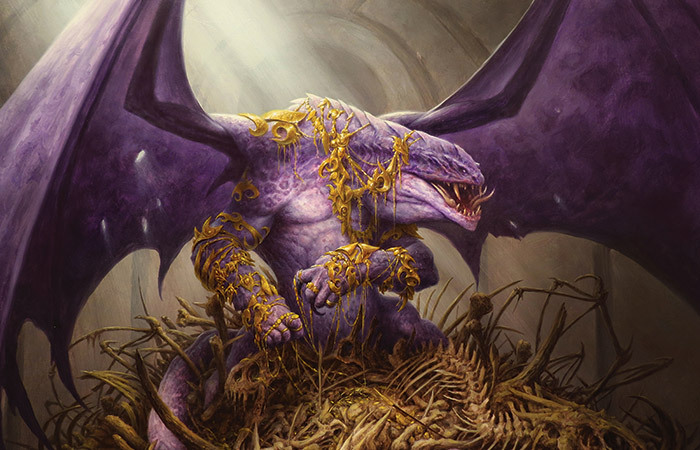 Today, let's take a look at a handful of Dragons from Dragons of Tarkir. 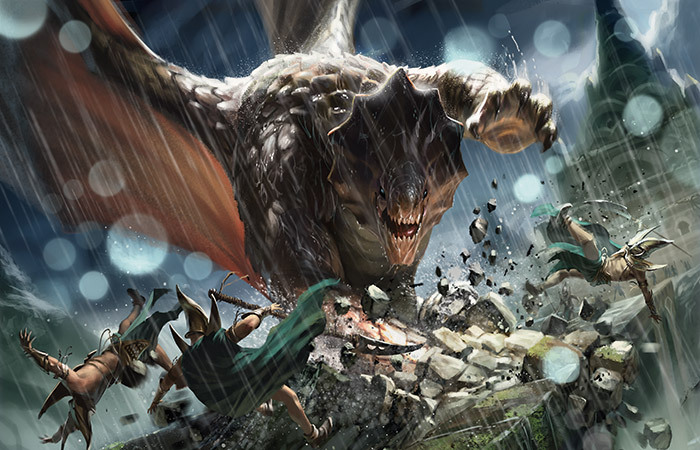 Take a look and see what the artists had as inspiration as they created these massive creatures of Tarkir. 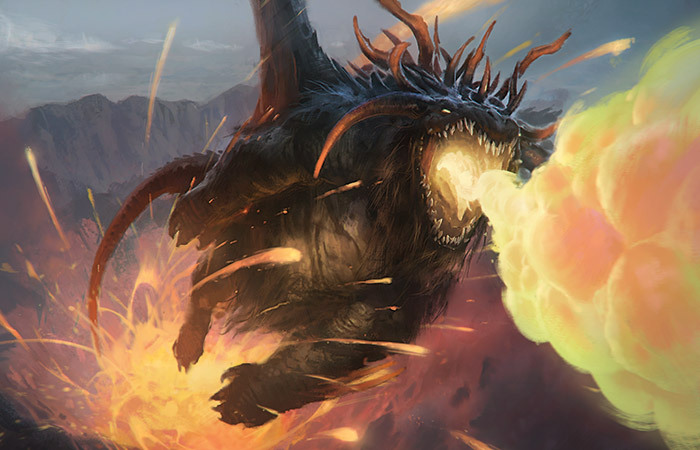 Action: Show an ATARKA-BROOD DRAGON that is flying straight up out of the crater of the volcano. The dragon is turbo-charged from the volcano's energy; it's mouth open wide and roaring, shooting forth a stream of green-tinged flame into the sky. Lava is erupting all around the dragon and splashing down onto the mountainside, where it is burning the forests. Mood: The soul of the volcano. Action: Show a SILUMGAR-BROOD DRAGON that is perched on a huge mound of humanoid bones, wings spread. The bones are from various clans (including its own), and there are pieces of armor, weapons, jewelry, and other treasures mixed into the heap. The dragon is adorned with finery from the fallen (such as necklaces worn as bracelets, or gems and coins pressed into its scales). Mood: The soul of the charnel house. Location: On the highest level of a temple/pagoda during a "dragon storm"
Action: This is the showcase portrait of the DRAGONLORD OJUTAI. The dragon standing imperiously on his two hind legs at the top of the structure, about to dispense wisdom to the assembled monks far below. His pose resembles that of a revered Shaolin master. His wings are spread, and his arms stretch out to instruct. 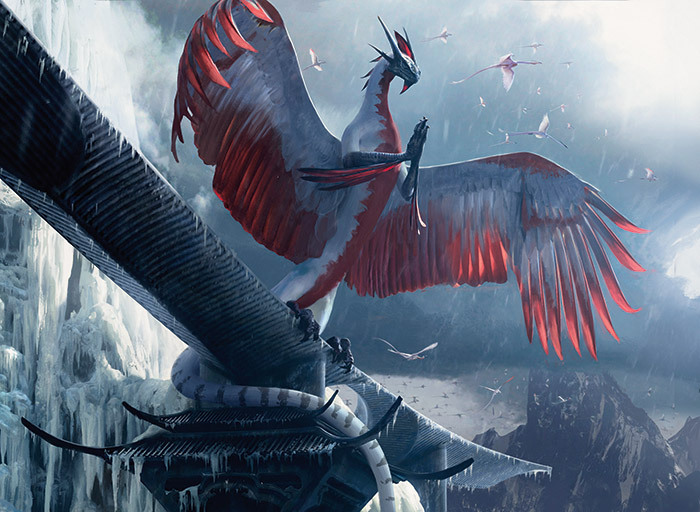 A "Dragon storm" in the background is creating more of Ojutai's brood. Mood: A proud, intellectual master. Action: A large DROMOKA-BROOD DRAGON is crushing the bridge that leads to the Silumgar palace. Some tiny Silumgar-clan warriors might be hurled in the destruction. Mood: A living wrecking ball. Action: This is an alternate take on a huge KOLAGHAN-BROOD DRAGON. It is strafing the ground over a group of much smaller KOLAGHAN-CLAN MOUNTED WARRIORS (mix of genders, can include orcs). 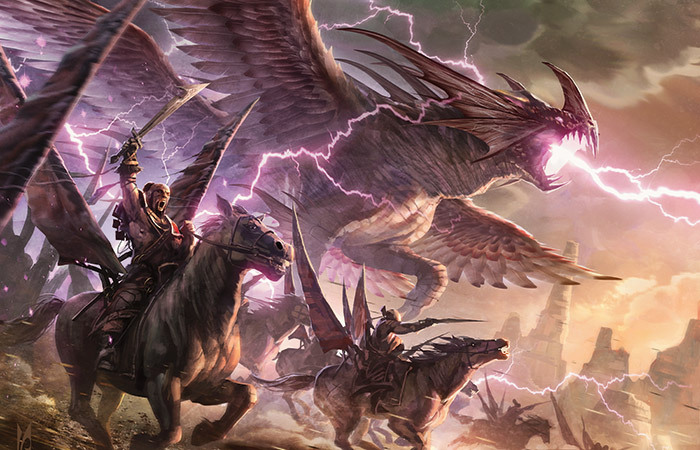 The riders are charging toward the viewer, with the dragon behind and slightly above them. Lightning is stabbing down from the dragon to the ground and being picked up and redirected by the riders' lightning rigs. The dragon is wreathed in crackling arcs of electricity. The dragon is about the size of the one shown on p. 292.